Theresa May’s Brexit not only reduces democratic and judicial oversight of future decisions – it could restrict UK activists’ ability to protest bad decisions, free from interference and intrusive surveillance. 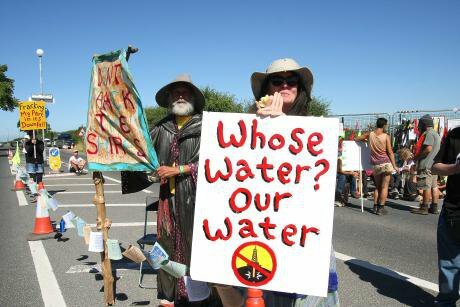 Image: Anti-fracking protestors in Preston, June 2018. Credit: Andrew McCoy/Zuma Press/PA Images, all rights reserved. The struggle to pass the EU Withdrawal Act was one of the biggest political upsets of the Brexit process so far. One of the major sticking points was human rights. Several related amendments proposed by the Lords were voted down by Parliament last month, leaving human rights advocates reeling. “As a result ordinary people will now have fewer legal tools to fight back when Parliament puts the interests of the powerful ahead of equality, fairness and human dignity,” said Martha Spurrier, Director of the human rights organisation Liberty after the vote. The EU Withdrawal Act transposes EU law into our domestic law, but it will also remove the Charter of Fundamental Rights of the European Union from UK law. It has also given ministers ‘Henry VIII powers’, which enable them to amend or repeal legislation without the usual parliamentary scrutiny. What does this mean for activists who may want to take legal action against environmentally destructive companies or policy, or defend their right to protest and collectively organise? The Henry VIII powers are one of the most controversial aspects of the EU Withdrawal Act for human rights campaigners. “It basically means ministers behind closed doors rewriting the statutes and then presenting them to parliament in a pretty impoverished procedural process which only allows parliament to either vote it up or vote it down. There’s not much debate and they can’t amend it,” says Corey Stoughton, Advocacy Director at Liberty, explaining that the usual set of processes and opportunities for intervention would not be there. This could make influencing policy change and formation, in relation to former EU laws, even harder for environmentalists. The argument goes that the loss of the Charter of Fundamental Rights is not a big deal because the right to freedom of assembly and association is in Article 11 of the UK’s Human Rights Act, which interprets the European Convention on Human Rights (ECHR). There are various restrictions on this, including that it would need to be “in the interests of national security or public safety”. Grogan says that the loss of the Charter of Fundamental Rights is something for activists to consider. “This is to me the greatest threat of Brexit, in terms of human rights,” she says. Its scope is also wider as it applies to European institutions as well as at the national level. According to the right by right analysis of the EU Withdrawal Bill, produced by the House of Lords and House of Commons Joint Committee on Human Rights, the loss of the Charter could diminish the enforceability of the right to freedom of assembly and association. While the EU Withdrawal Act and current Brexit process may not present a direct threat to the right to protest, there are other aspects which could have an impact on activists. For example, increased restrictions on freedom of movement could restrict activists who want to cross borders to take direct action, or work in solidarity with others. For Blowe, one of the biggest concerns about Brexit for environmental activists is the potential loosening up of regulations that apply to businesses, of which the fracking industry is a prime example. “I think the weakening of the regulations will make it easier for companies to get away with a lot more,” he says. “The institutions that are responsible for this regulation – the Environment Agency and so on, have been gutted over 10 years of austerity and don’t have enough staff that can actually deal with this stuff. Article 8 of the Charter of Fundamental Rights covers the protection of personal data, including stipulation that data concerning individuals must be processed after their consent, or “some other legitimate basis laid down by law”. It also says that everyone has the right of access to any data collected that concerns them, as well as the right to have that data rectified. and records about those communications created by our devices. It also allows the creation and linking of huge ‘bulk personal datasets’. “Depending on how courts interpret the privacy rights that we have under the Human Rights Act, the EU Withdrawal Act may prove to be a danger to encourage growing government surveillance, unconstrained by the safeguards that are needed to make sure that the surveillance powers aren’t used to spy on people engaged in protest activity,” says Stoughton. Liberty has made several legal challenges to the Investigatory Powers Act, including a successful High Court challenge in April. The Charter of Fundamental Rights was referenced several times throughout the ruling, which concluded that Part 4 of the Investigatory Powers Act 2016 is incompatible with fundamental rights in EU law. He points out that new GDPR regulations could potentially be used by campaigners to target companies who may also be gathering information about activists and sharing it between them. GDPR will remain part of UK law after Brexit and Blowe does not seem worried that it, and other data protections, will be significantly amended straight after. “I can’t imagine, given the complexities and the fact that data is shared internationally, that there is anything that a post Brexit government can do to undermine data protection regulations,” he says. In their 2017 manifesto the Conservatives said that, while they wouldn’t repeal or replace the Human Rights Act during the Brexit process, they would “consider our human rights legal framework,” once it was over. The promise to remain a signatory to the European Convention on Human Rights was only extended for the duration of this parliament. As Home Secretary, Theresa May promised to scrap the Human Rights Act and her party’s 2015 manifesto reiterated that promise, saying it would introduce a British Bill of Rights. But how likely is it that the next government will scrap the Human Rights Act as soon as it takes power? “I wonder how much of a priority it is behind trying to sort out trade negotiations, agriculture and all the other horrendously complicated things that they’re going to need to do,” says Blowe, who points out that a government would not need to get rid of the Human Rights Act to restrict the right to protest. “That’s happened pretty much consistently over the last 15 years. There have been bits of laws that have given the police additional powers,” he explains. Stoughton says that while there is nothing about the EU Withdrawal Act that will necessarily make it easier to repeal the Human Rights Act, the sounds the Government have made on it have left her concerned. While it seems the way that police behave can sometimes be down to luck, dependent upon how well they know the law and how they interpret it, it can also be argued that laws can help defend against some of the worst treatment of activists by police paid to protect property and financial interests. Human rights laws and other legal protections can also be used by activists to hold the state to account on a range of issues, from protest policing to surveillance. As we leave the EU and ministers seek to amend such laws, we may need to put up a fight or see them quietly erased.